In Uttar Pradesh, one strand of the Congress strategy focusses on whether 'behen', or sister, Priyanka Gandhi Vadra, can convince sections of upper castes and OBCs, that a resurgent Congress has the ability to weaken the influence of 'behenji', the honorific for Bahujan Samaj Party (BSP) chief Mayawati. Priyanka, the Congress general secretary in-charge of eastern UP, debuted on social media platform Twitter on Monday morning. By evening, as she traversed the streets of Lucknow for five hours in a road show, her Twitter followers increased to nearly 100,000. Mayawati had officially announced her debut on the social media platform on Wednesday, and the number of her Twitter followers on Monday evening were nearly 76,400. While Priyanka was yet to tweet from her handle @PriyankaGandhi by the evening, Mayawati has taken small steps in the last six days to use the platform more frequently. After the road show, Congress president Rahul Gandhi said he respected Mayawati and Samajwadi Party chief Akhilesh Yadav, but implored the party to fight in UP for its ideology. He, at least publicly, indicated the party would not surrender an inch to the SP and BSP. The Congress is not part of the SP, BSP and Rashtriya Lok Dal alliance for UP’s 80 Lok Sabha seats. Congress party’s “front foot” approach in UP, according to party insiders, is two pronged – strengthening its Brahmin and Kurmi support base, particularly in its identified 29-Lok Sabha seats and denting the BSP wherever possible, essentially 10-seats. Of the 29-seats, 21-seats are those the Congress won in 2009 Lok Sabha polls. The list includes 13-seats of Awadh region, where the Congress bagged a respectable 17.8 per cent vote share even in the 2014 Lok Sabha polls. Some of these seats are Amethi, Rae Bareli, Pratapgarh, Unnao and Barabanki. The Congress has influential leaders and strong local presence in the Awadh region. Party leaders believe Congress should devote 80 per cent of its resources in these 29-seats, while field upper caste candidates in rest of the 51-seats to help others defeat the BJP. The Congress believes its short-term revival in UP rests on convincing upper castes, and sections of the OBCs that the party will not support Mayawati in becoming the prime minister, and its long-term resurgence in emasculating the BSP’s support base of Dalits and Muslims, particularly as the BSP chief has no successor. It has decided to launch a pre-poll campaign that is unlikely to be soft on the ‘grand alliance’, particularly the BSP. Congress strategists say any suspicion of a truck between the Congress and BSP would not only cost the party in UP, but also in Chhattisgarh, Rajasthan and Madhya Pradesh, where the Congress benefitted in the recently Assembly polls because of the shift of upper castes and sections of OBCs. The BSP, the Congress believes, is on the decline. The BSP has lost vote share in Rajasthan and Madhya Pradesh for a second successive election. In MP, the BSP vote share declined from 8.97 percent in 2008 to five percent in 2018, and seats from seven to two. In Uttar Pradesh, the BSP vote share has shown a similar trend. It lost 3.68 per cent vote share from 2012 to 2017 Assembly polls, and 7.82 per cent from 2009 to 2014 Lok Sabha elections. The Congress believes the BJP has been the primary beneficiary of this shift, but that the Congress can dent the BSP in ‘swing seats’ of Jhansi, Barabanki, Saharanpur, Kanpur, Ghaziabad, Gautam Budh Nagar, Kushinagar, Faizabad, Kheri and Dhaurahra. In addition to this, the entry of Priyanka could help the Congress appeal to the youth and women voters. In 2014, the BJP received 51 per cent of first time voters, while its vote share was less than 45 per cent in other categories. The party’s assessment, based on data from survey agencies, bears out that its success in UP from 2007 to 2009 rested on increased support from three communities – Kurmis, Brahmins, and non-Thakur upper castes, like Kayasthas, Khatris and Bhumihars. However, it lost this support to the BJP in 2014. 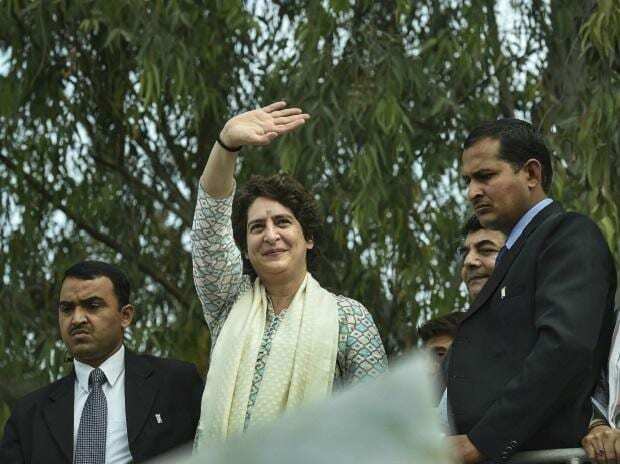 The party is of the view these sections disenchanted with the rising dominance of Thakurs under UP CM Adityanath, could return to the Congress led by Priyanka and Jyotiraditya Scindia. The most crucial of these castes for the Congress is that of the Kurmis, a farming community, and the Congress would try project its Kurmi leaders R P N Singh and Chhattisgarh CM Bhupesh Baghel, as also take to them its promise of farm loan waivers. The Congress has subdivided the 29-seats into three categories, with an eye on the party improving its standing in the state in the 2022 Assembly polls. These three categories are 16-seats where believes it has a "strong chance of victory", 8 seats where it has a "moderate chance" and 5 seats where it can put up a strategic fight to help defeat the BJP. The Congress has identified Rae Bareli, Amethi, Pratapgarh, Kushinagar, Barabanki, Unnao, Faizabad, Kanpur, Kheri, Dhaurahra, Jhansi, Farrukhabad, Saharanpur, Moradabad, Bareilly and Ghaziabad as the seats where it has a good chance of winning. The Congress has latent vote share in five seats it had done well in 2009, but the party has suffered because of quitting of leaders like Beni Prasad Verma in Gonda, Jagdambika Pal in Domariyaganj, Rita Bahuguna joshi in Lucknow and Nandgopal Nandi in Allahabad. It also believes Narendra Modi would be difficult to defeat in Varanasi.